I’ve said it before, and I stick with it: the problem with visiting iconic locations is getting a shot that’s not been made a million times before. The clouds are just about the only thing that sets this apart from everything else that looks just like it. 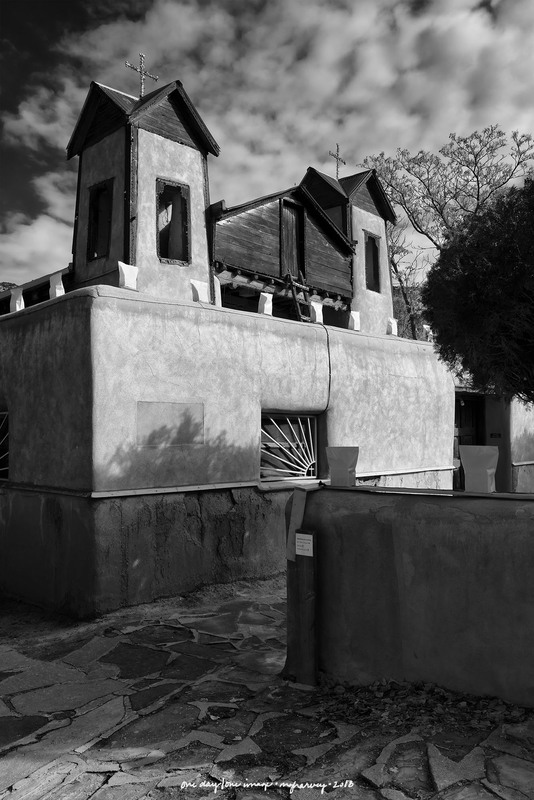 Posted on November 22, 2018, in Photography and tagged 365 photo project, black and white photography, chimayo, church, El santuario de chimayo, learning to see, melinda green harvey, monochrome, new mexico, one day one image, photo a day, photography, postaday, road trip, thoughtful seeing, travel photography. Bookmark the permalink. 2 Comments. Ya done good. We of the MGH Fan Club ( MGHFC ) are thankful for you. Thank you. I hope you and the rest of the FC had a good Thanksgiving.